Yesterday, I was in downtown Santa Rosa, and visited Old Courthouse Square, for the first time since the completion of its “reunification”. Despite controversy over the cost of the project, the result seems to have been successful, as shown above. The new space seems much more open and welcoming than the previous divided “parks”, and more effectively isolates pedestrians and other park users from the traffic. Santa Rosa has had an unfortunate history of short-sighted town planning decisions, so let’s hope that this turns out to be one of the better ones. This part of Santa Rosa is perhaps most famous for having featured prominently in Alfred Hitchcock’s 1943 movie Shadow of a Doubt. Thanks to its restricted wartime budget, the movie made extensive use of real locations in Santa Rosa instead of studio sets. The result is a unique glimpse into day-to-day life in the city all that time ago. The still below from the movie shows the exterior of the Til Two Bar, which would have been on the far left in my photo above. In the background of the movie still, you can see the Empire Building (then known as the Bank of America Building), which exists today and is prominent in my photo. 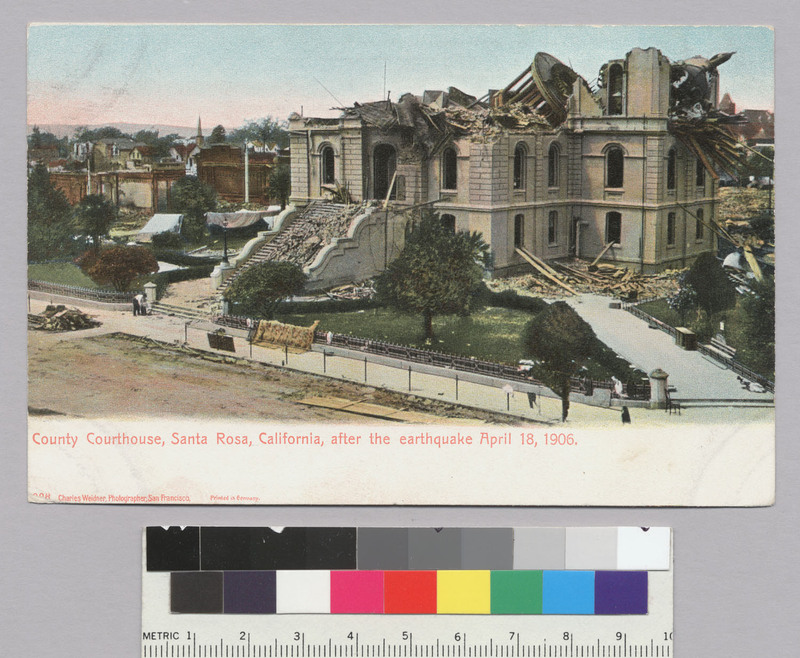 The central courthouse building that appeared in the movie was demolished during the 1960s, but in my heading photo above, the cruciform area of grass marks the plan of its predecessor, the original City courthouse, which collapsed in the 1906 earthquake. After the replacement courthouse was demolished, the square was split by a road driven through to connect Sonoma Avenue to Mendocino Avenue, but which turned out not to have been a wise decision. My next photo, below, shows a close-up of one of the monuments that have just been placed around the grassed area in the square. They look great at the moment, but I wonder how well they will withstand the weather and the vandals? From the north side of the square, looking down Mendocino Avenue, the Rosenberg Building is still prominent, as shown below. This used to be the location of Santa Rosa’s Woolworths store, and is still a retail location now. Finally, wandering a bit farther down Fourth Street, the former Rosenberg’s Department Store is occupied by Barnes & Noble, as shown below. Santa Rosa made another bad town planning decision when they approved the building’s demolition in 1994, but, fortunately, instead of demolishing it, the bookseller did an amazing job of restoring this Streamline Moderne (Art Deco) building. P.S. June 7th: this new article in the Bohemian provides more details of the square.